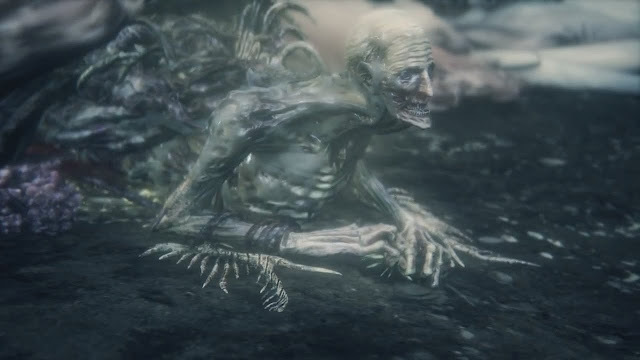 The following content was originally created in this thread in /r/bloodborne. All credit for the content of this post goes to SlowlyHomoeroticism, with only minor changes being made to reflect the difference in format. This post explores what exactly the sin was that Byrgenwerth committed. So the sin that Byrgenwerth committed is very vaguely mentioned but very heavily supported. We know that they must have devastated the Fishing Hamlet and probably killed many of it's inhabitants, but a lot of it is extremely unclear. But that alone I don't believe is the sin that they committed. At least, not completely. This is just what I got from the story, I don't really feel like it's more or less right, but it's what I immediately came up with while I played and it seemed likely. To break this down, lets go over three big things I believe matter the most. Great Ones have a somewhat adverse effect on humans. Humans in the presence of Great Ones or even the impact that Great Ones have tend to go insane. This allows them to serve some higher purpose, but it is at the cost of their sanity and very often they actually physically change to more closely resemble the Great Ones themselves. Great Ones are inherently sympathetic. When they are summoned, they try to help, and are not evil creatures. They simply have side effects. Great Ones, more often than not, miscarry. They seek surrogate mothers to bear their children, because they themselves cannot. So when the body of a Great One, Kos, washes onto a beach bearing a child, it is a massively significant event. Not only has a Great One died, but it successfully bared a child. So when the villagers did eventually find the body of Kos and her Orphan, they worshiped it. The Orphan grieved for it's mother, but it would have been sympathetic to the people of the hamlet, and it's influence is clear. The villagers all transformed into sea beings, all very much like Kos and her child. They worshiped the Orphan, and it tried to help them as it could and as all Great Ones do, as how could it understand the horrible side effects it had on these people? And then, eventually, Byrgenwerth came. Already having contacted Formless Oedon, they understood the Great Ones existed, and sought to understand them. They came upon the Hamlet and kidnapped the villagers, ransacking the village. They preformed lobotomies on the villagers, to find if they had eyes on the insides of their brains, and if they held the secret to ascension. Naturally, the villagers after some point would no longer go quietly, or perhaps they never did. However, to force them and kill anyone who would not come alive, Byrgenwerth created an elite force of fighters; Gehrman and his students. They were the first "Hunters", though they likely did not go by the name at the time. These hunters put down whatever threat may have come from the village, and kept a sort of order for the college to do their experimentation. I believe they did so not knowing what they were truly doing, simply following orders and killing what they believed to be mindless beasts. But Great Ones are sympathetic in nature, and the Orphan of Kos would not have simply let these people be slaughtered. So he likely attacked directly, leading a force of the villagers. Being a true Great One, and extremely powerful, it's likely he caused quite a problem for Byrgenwerth. Which they simply could not have, and if something were to disrupt their experiments, it had to be destroyed. So, unaware of the true nature of their attacker, the Old Hunters fought back. Eventually, one of them managed to fight through the villagers, through the caverns, and to the coast. This hunter killed the Orphan, and ended the Hamlet as a threat to the school. However, in doing so, she saw exactly what she had done. Maria had fought her way to the body of Kos, and understood. She had killed the child of a very powerful being, one she could never understand truly. Disgusted at her own actions, and the actions of the school, she threw her sword into the well, and killed herself in grief. However, Great Ones are powerful beings, and if one can create a dream for humans to exist in and persist beyond death, it's not unlikely that one can create a dream for itself to persist in. So the Orphan escaped, in mind, to a dream. In the dream, it raged and wished for revenge for itself and it's people, against the people who had harmed them. So the dream became a Nightmare. The Orphan brought in the villagers lost to the first hunt, and recreated a twisted version of their former home, to live in peace and to protect themselves. It brought in the hunters who had died fighting, and forced them to relive their hunt forever, never ceasing. One of the first it brought into the Nightmare was the person who it must have hated most, Saint Maria. However, Maria, possibly to try and atone for her sins, stood guard. She watched over the Hamlet, and protected it from any potential invaders. She held the key, and she made sure it could never be used. Now, ultimately, the Hamlet must have been a failure. Master Willem never seems to have gotten very far in his research into insight, and ultimately it must have caused frustration for his students. Laurence, willing to experiment with the Old Blood, separated and created the Healing Church. The Church, naturally, required more hunters. So the Old Hunters were expanded, and created the Workshop. More and more hunters since then have been dragged into Nightmare, expanding it with their memories, simply because of the Orphan's rage against it's murderers. The Church must have realized it, eventually. So they sent in one of their own, a blood-crazed hunter wracked with guilt, who would be placed to protect their secrets and kill anyone who managed to find the truth in the Nightmare. At some point, one of their own must have also escaped to the Nightmare, to lead those who wandered in to the truth if he could. The truth being not just that Byrgenwerth killed and massacred a village, but that they killed a Great One. They murdered a being beyond their own comprehension, for the sake of failed experimentation. A Great One, born of a Great One, who simply wished to protect their home. A thing so rare and precious it should have been protected, killed for defending it's home. That is their sin, and it's one they should be punished for. But the Orphan has to be stopped, and we have to stop him, because his punishment is too harsh. Hunters have only ever fought for the scholars. For the Church, and the school before it. They must, and should be punished. Those that took part in the massacre are already living out eternal torment in their own ways. But the Orphan is too powerful, too angry, and sees no difference between the ones who wronged it, and those who fight for misguided goals. The Sin that Byrgenwerth committed was great, massive in consequence and scope, and ultimately worthless. But hunters do not deserve the punishment. So we go in to kill the Orphan's mind, and end it's presence in the Nightmare. But maybe that's for the best. Even for an ascended being, generations of rage and hatred must be exhausting. Maybe we're not just doing this for our brethren hunters, but maybe we're doing the right thing by finally putting the Orphan to rest. To finally, after all these years, calm it's rage and let it move on, to wherever gods go when they die.